Rug Cleaning Seagoville Teams Are Ready for A Challenge! Our rug cleaning Seagoville teams know that cleaning rugs can be a tricky business. That’s why you need the professional Rug Cleaning Teams from KIWI for all of your rug cleaning needs. Here’s why: The rug cleaning Seagoville teams to know there are literally thousands of weave patterns recognized, and there are many individual variations within each type. Rug weaving is an ancient art in many different cultures, passed down from generation-to-generation and jealously guarded. There are Turkish, Kurdish, Indian, Chinese, Afghani, Pakistani, Akstafa, Armenian, Avar, Baku-Chila, and many more types of rugs. And no two hand woven rugs are exactly alike. Seagoville rug cleaning teams know that each type has its own special needs. In addition, the dyes used are oftentimes natural, made from nuts, berries, plants and minerals, with living colors unmatched by today’s synthetic pigments. Our professional rug cleaning teams include experts that can identify your rug and its needs. We even have Seagoville Oriental rug cleaning services for all of your needs! We gently hand wash your carpet, the traditional way, and dry them flat to avoid stretching, color bleeds and/or migrations. We never submerge carpets in tubs of harsh detergents and hot water. We will never hang your carpet to dry. We treat them equally, whether it is a priceless Oriental rug, or an economy throw or area rug. When your precious rugs need cleaning, let the experts at KIWI give them what they need. Call us today for a free rug-cleaning estimate. 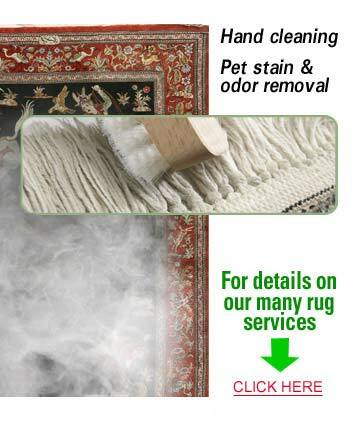 You’ll be enlisting the help of the best rug cleaning services in Seagoville, Texas!